The Lenovo ThinkPad Yoga 14 melds what you love about a workstation with a 2-in-1 laptop, but buyers should be wary of borked batteries. 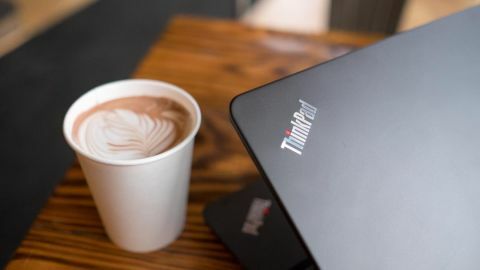 The ThinkPad name is a staple in the workstation world, but with the tablets quickly taking their place as business machines, laptops need to evolve. The Microsoft Surface Pro 3 is a clear cut example of how much more capable and flexible a hybrid machine can be over a traditional notebook. Lenovo has long produced its excellent line of Yoga machines, and first brought the Yoga design ID to the ThinkPad line in late 2013 with favorable but mixed results. Today, this 14-inch hybrid machine pretty much checks off all the marks for a solid 14-inch work laptop, including Lenovo's signature "Lift 'n' Lock", Accutype keyboard and trackpad, along with a vibrant 1080p screen. The ThinkPad Yoga 14 sounds like a win-win for productivity and play, but during my testing, revealed a major manufacturing flaw. Worse off is that, based on some brief research, the issue more common than it should be. But more on that later – let's discuss this business rig's look and feel first. The ThinkPad Yoga 14 is made with a mix of Lenovo styling as well as elements inherited from ThinkPad machines. For instance, the lid is made with a solid piece of magnesium, while the remainder of the laptop is housed in a curved plastic frame. It might seem like this notebook is in the midst of an identity crisis, but the blend of elements works well. The laptop takes the best qualities from both Lenovo's consumer-oriented models and ThinkPad workstation platform. Like rest of Lenovo's Yoga line, this machine is fitted with metal hinges that allow the screen to flip backwards 360 degrees, transforming the unit into a tablet. The hinges work like a charm, with just the right amount of resistance to prevent the screen from flopping about while still being flexible. The added functionality isn't just limited to a tablet mode, there are three more additional modes. You could turn the laptop into a tented touchscreen display by turning the screen back until the unit creates a "V", about 270 degrees, and standing the unit on the lips of its screen and base. Alternatively, you could turn the Yoga 14 onto its side to use it as a vertical screen for reading documents and long news articles. Lastly, there's also the option of sitting the Yoga 14 on its keyboard's face and rotating the screen to turn the convertible machine into a makeshift monitor. Now, what's this Lift n' Lock keyboard all about? This unique keyboard deck lifts up to sit flush with the keys, turning the entire keyboard into a flat plane whenever users fold back the screen. It's an ingenious little mechanism that fixes a long-standing annoyance of mashing the keys whenever you hold up Lenovo's Yoga machines up as a tablet. By this point, I was fairly smitten with the Lenovo ThinkPad Yoga 14. Sadly, further testing uncovered a major issue. Lifting the laptop from its front left corner causes the system to shut down immediately. Not even sending the defective unit back for repairs solved the problem. Unfortunately this defect is more common than it should be. A quick web search reveals that other users are running into the same issue, not to mention other defects with the ThinkPad Yoga 14 battery. Multiple users on Lenovo's own forum have reported random shut downs when the machine is unplugged, as well as rapidly-decaying battery life issues. To help out afflicted ThinkPad Yoga 14 users, Lenovo offers a replacement option, which is much appreciated. Regardless, it's disconcerting to see there are such widespread problems with this particular machine, especially for business customers that might purchase a fleet of these products.